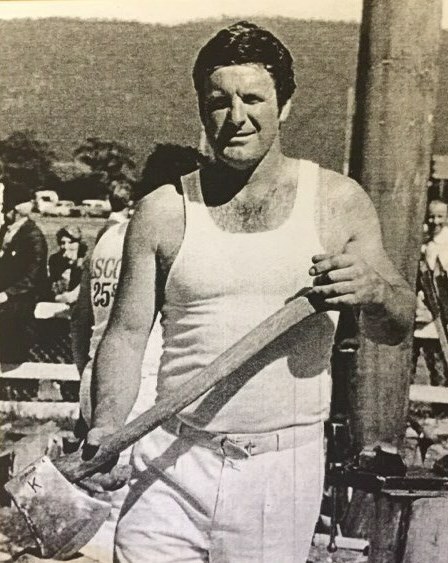 Born at New Norfolk to Edward and Minnie Timbs, in a family of eight, he commenced woodchopping in 1964 at the Elwick Hotel, along with his brother Baden, they teamed up quite often in double handed sawing events, and took out first place at the Royal Sydney Show in the early 1970’s. John had broken records in several World Marathon woodchopping events, in 1979 he broke a world record in a 60cm (2 foot) underhand log, a record which has been set un 1898 – 1900 by J. Brain, John’s cutting time was 2 mins and 56.6 seconds this was 1 min and 4 second faster than that set by Brain. Again in 1984 he broke two world marathon records, first on New Years day at the Busy Park Show he cut against Garry Hewitt of QLD. in the Ironman event, which consisted of 300mm standing, 300mm underhand, 375mm single sawing and 300mm tree-felling, he set a new record of 3 mins and 37 seconds cutting 1 mins 52 seconds off the time set previously by Geoff Sweetman of NSW. In early April of the same year he competed against Martin O’Toole of Vic. Slicing through 5 x 350mm (14 inch) underhand logs in 3minutes and 30.7 seconds cutting 1 minute and 13.2 seconds form the previous record. John was also a very strong teams cutter and would really excel when the chips were down, during the 1970s the Southern team were almost certain to lose but he was switched from the first to last standing bock and the South were the victors by almost half a block. He was a very strong competitor in tree-felling events and several times was only beaten in Championships by one of two blows. He competed at all the major shows throughout Australia, New Zealand and Papua New Guinea, he was the only Tasmanian Axeman to compete in Jakarta at the Highland Games in 1984 along with Terry Kennedy N.S.W, John Goodwin and Mark Hughes N.Z. 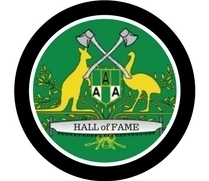 John was a committee member of the Bushy Park Show Society for a number of years and also the Maydena Axemen’s Club for 23 years where he was always a very dedicated and willing working member, helping with organising logs for both these carnivals.